← Managing Your VT Room – Part 2 – Can You Hear Me Now? When you stop to think about why some kids struggle, ultimately it’s because they cannot maintain an arbitrary level of proficiency which has been created based on several hundreds of students who came before. For example, third grade curriculums are often written based upon the success or failures of previous third graders. When you have a child who falls short, or is labeled “special needs”, a lot of times it’s because they simply learn differently than those students’s performances upon whom the standards were based. Most times when this occurs, kids become defeated, upset, annoyed, frustrated, angry, shy, bored…you name it. And then, they come to see us. If a patient has a hot button for defeat or failure, you’ll probably learn pretty fast where it is as soon as you try something they perceive as difficult. Ever had a patient shut down and say they want to go home? Me too. One technique to try in these situations is to change the mindset, or what I like to refer to as “flipping the game”. Rather than letting the finish line exist at all, flip the game so success is defined only by the upcoming performance, without reference to previous attempts or the performance of others. In most classrooms, kids define success and failure by the product they create as compared to their peers. To flip the game, you simply must keep the focus on the process, and celebrate the patient’s willingness to interact, participate , and succeed at a level they define on a daily basis. Find a way to show them their methods are good, their intelligence is strong, and their efforts are valuable. If you can do this, I encourage you to sit back and watch them blossom into a flower of hope, right before your eyes. Growing up along side a sibling with developmental delays certainly left a lasting impression in my life, and I’ve written of my younger brother’s struggles in previous posts. Although he was never diagnosed with more than a gross developmental delay, my hunch is by today’s standards, he would fall under a high functioning spectrum disorder. My parents faced tough choices on the most appropriate schools, the best approaches for further cognitive examination, and the most effective associated interventions while trips to Psychiatrists, Educational Specialists, and Occupational Therapists just became part of the normal routine. My youthful eyes and mind could not comprehend the murky waters my parents navigated to find the best treatment options, but as a parent who now works with struggling kids, the water certainly has cleared. It couldn’t have been easy. Some unfortunate memories associated with that time are conversations of what my brother would never become – an architect, a writer, or even a pilot – a realization that surely was extremely emotional and difficult for my parents. Even now, the topic is all but off limits. Spending my formative years in that environment provided many important lessons – most of which have been employed in my therapy career – but the biggest lesson, by far, has been simple. Some people are different, and that’s OK. 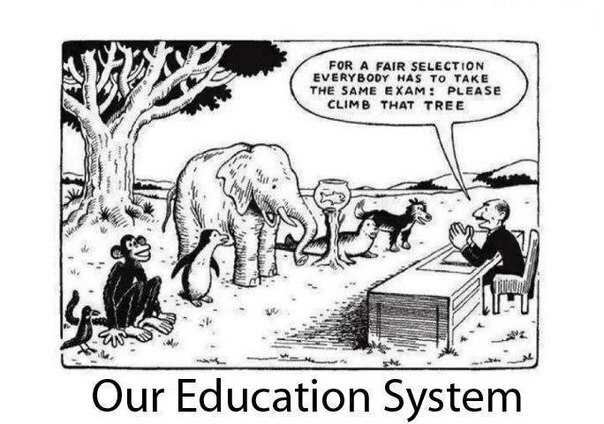 This picture depicts for me what every child subjected to standardized testing must feel like. One or two classmates will excel, some will figure it out, some are riding the fence of failure depending what kind of day they are having, and some just haven’t got a chance. It’s a sad but true statement. The kids that struggle and/or risk failure usually are the kids that enter Vision Therapy, and have parents that are hoping against hope that we can unlock their child’s potential. Sometimes we are a great success, and sometimes we are simply a piece of the puzzle. Incidentally, a close personal friend sent this picture in an email, and in the course of conversation, we identified my brother as the fish in the fishbowl. The analogy fits because not only does the test seem incredibly unfair to the fish, it has zero percent chance of reaching to top of the tree without intervention. This is my brother in a nutshell. My passion for those that struggle came out in force recently, from a place which admittedly can be raw at times. One of my newer patients is a young girl who has just finished 1st grade. Her parents are both strong, well spoken, highly educated, and powerful local business people who conceivably don’t get much practice responding well to the word “no”. Referencing the old cliche, people jump long before her parents say anything. During our orientation some weeks back, her mother made a comment that really hit a nerve with me. She said “I want the teachers and other kids to think my daughter is smart“. Huh?? Never wanting to inflict my own judgment on other’s ideas, we rolled past the comment, and finished our session. But in case you can’t already tell, it bothered me. A lot. Not because it seemed she was being curt or cynical, quite the contrary, because the comment was completely straightforward and sincere. That was her main goal for her daughter, what other people thought. In the four or five sessions following the orientation, my understanding of this mom has broadened significantly. To say she is a warm and caring parent would be a gross understatement. She really is an amazing representative for her child. Feeling confident in our bond, I inquired about her comment down the road, after excusing her daughter from the room. Not because of an ax that needed grinding, but because it seemed entirely unfair and just didn’t fit within the framework I came to know of her parenting style. “People judge my daughter” she tearfully admitted. “They judge her because she can’t tie her shoes, because she doesn’t know her alphabet, because she cannot remember her own birthday, and because she isn’t like other kids. So many people have scared me into believing she will never be normal. I just don’t know how to make it better and all they do is point out how hard a time she’ll have“. And I thought my friends could be harsh. Feeling a bit shaken, and concerned that I had over stepped, I shared the story of my brother’s trials and tribulations along with how that experience brought me to want to help people as an adult. He is not a success story by the standards of “normal kids”, but we found the positive things he does well, and we praise it. His version of success is redefined with every accomplishment, whether the world sees it or not. He truly is his own success story. The next words I spoke were forceful, emotional, raw and a true reflection of a lifetime spent defending my brother against society. Posted on June 23, 2016, in From My Perspective.... Bookmark the permalink. Leave a comment.